The Hubble Space Telescope recently captured an image which looks remarkably like a smiling face in the sky. It is SDSS J1038+4849, a galaxy cluster that resides just outside the constellation of Ursa Major. But what makes this image look so close to a smiley face? Thanks to NASA and the Hubble Telescope we now have the largest and clearest image ever taken of our universe. It is a 1.5 billion-pixel image (69,536 x 22,230) of M31, also known as the Andromeda Galaxy. Orion, the hunter, is one of the most popular constellations in the night sky; so you may have already seen him this winter or in late fall. Throughout the year, no matter the season, when I am in schools with our Discovery Dome portable planetarium someone often asks me to point out Orion. The mighty hunter is also one of the largest and easiest constellations to find. Most people find it by locating the three stars that make up Orion’s “belt” which is an asterism or recognizable group of stars that are part of a constellation. The names of the three stars that make up Orion’s belt are Alnitak, Alnilam and Minatka. One of the brightest stars in the sky is on Orion’s right shoulder. It’s called Betelgeuse. Orion’s belt is the only group of three stars that are spaced so evenly making them very easy to recognize. Once you have found the belt, the hunter easily pops into view especially when it is right overhead during the cold evenings of winter. Besides being easy to spot, the constellation Orion is also where you will find one of the most beautiful objects in the night sky, the Orion Nebula. 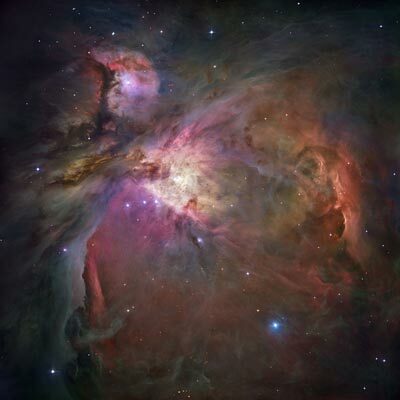 Count down to the third bright object in Orion’s sword and you will find not a star but the Orion Nebula. With binoculars focused on this object, you will find many stars rather than one. 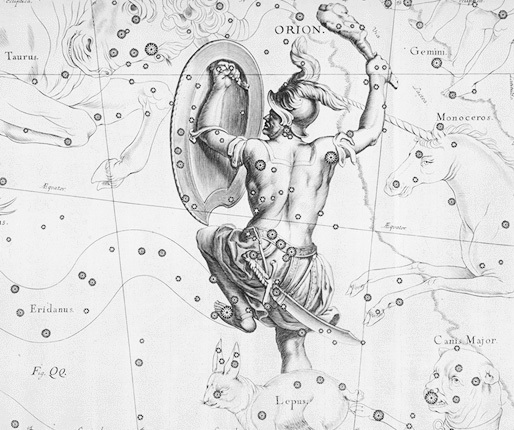 So the next time you look for Orion in the night sky be sure to also take a look at the third object in his sword for the giant cloud of gas and dust that makes up this birthplace or stars and solar systems. The Orion Nebula from the Hubble Space Telescope. Earth is known as the ‘blue planet’ because of the vast oceans that cover two-thirds of its surface. When seen from space, our world looks like a pale blue dot. Back in 1990 a photograph of the Earth that was taken by the Voyager 1 spacecraft when it was 6 billion km away! But now, for the first time ever, astronomers have uncovered the color of a planet orbiting a distant star—and it’s blue, too! But that’s where the similarities between the two planets end. The new world, or the deep blue dot, is an enormous gas giant, similar in size to Jupiter, the largest planet in our Solar System. It orbits very close to its star, leading its atmosphere to reach scorching temperatures of over 1000°C. You might wonder how blue oceans can survive in this extreme environment. Well, unlike Earth, it isn’t water that gives this world its lush blue color. Its atmosphere is filled with something similar to glass particles, called ‘silicates’, which sparkle blue. Artists conception of what this exo planet might look like. 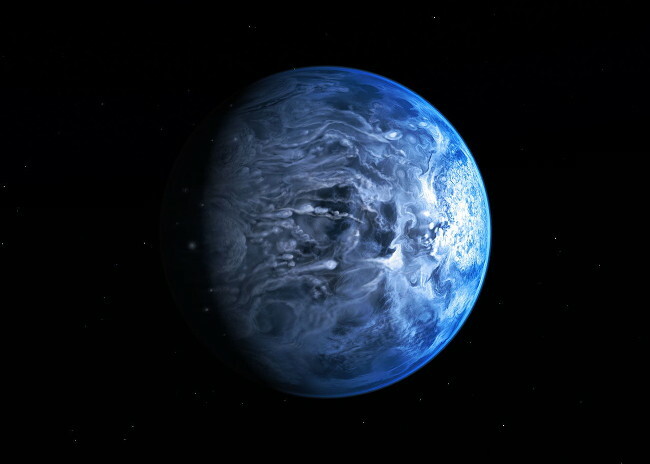 Astronomers believe it rains glass on this planet! And the glassy rain comes down in sideways torrents, blown by howling winds moving at 7000 km per hour! While the words ‘pale blue dot’ make us think of calm, tropical waters and light summer rain, this ‘deep blue dot’ is all sharp, raging storms and boiling heat.